Moonstone has captivated the hearts of jewelry lovers for centuries. The stone's seemingly bland appearance is made spectacular with the presence of light and movement. The glowing sheen and soft color are luring. Learn about common and not so common moonstone facts and uncover unique history and meaning of the stone. This is helpful if you already own moonstone jewelry or are planning on purchasing it. Moonstone is a mineral of the orthoclase feldspar group and is composed of potassium aluminum silicate. It is distinguished from other similar stones by the presence of adularescence. Though the stone has optical qualities similar to some labradorite stones, labradorite is a plagioclase feldspar whereas moonstone is orthoclase feldspar. Plagioclase feldspar is composed of calcium and sodium and orthoclase feldspar is composed of potassium. Adularescence is the optical phenomenon that causes the extraordinary glow on the surface of moonstone. The light moves across the stone much like moonlight would glide across a large body of calm water. This happens when light reflects off of the thin layers of different feldspar minerals within moonstone. The layers act as a diffuser, softening the light and allowing it to bounce around the stone. Anna Sheffield Moonstone Engagement Ring. Even though moonstone ranks between 6 and 6.5 on the Mohs Hardness Scale, it can be prone to breaking due to the cleavage within the stone. Cleavage is the tendency for a stone to break along its planes or layers. Moonstone jewelry usually takes the form of earrings and necklaces since they're less likely to receive hard blows than rings. Since moonstone has been becoming more popular, some designers are creating moonstone engagement rings. If you opt for a moonstone engagement ring or ring you'll be wearing often, be sure the stone is sufficiently protected. You'll want the stone set deep into the setting with a diamond (or another jewel) halo protecting the outside edge. Though this helps protect against damage to the side of the stone, it will not protect the top. Moonstone requires special care when cleaning. Ancient cultures coveted moonstone and created origins for the stone as spectacular as the stone itself. Many believed the stone was created from moonbeams. Others strongly associated the stone's powers with the moon. The stone was especially prized during a full moon. Moonstone is thought to bring its wearer good fortune and feelings of love and affection. Moonstone found its way into jewelry throughout history, but it wasn't until the early 1900s that the stone became an iconic and important focal point. In the years preceding the Art Nouveau Era, moonstone was often used as a small accent stone. Some man in the moon pieces existed, but these were rare and less common. Artisans like René Lalique brought on a powerful change with the Art Nouveau and Arts and Crafts Movement. Natural, mystical stones with unique properties were favored over traditional glitzy stones. The Art Nouveau period was short-lived and the Art Deco movement was soon to follow with a heavy emphasis on diamonds and precious gemstones. 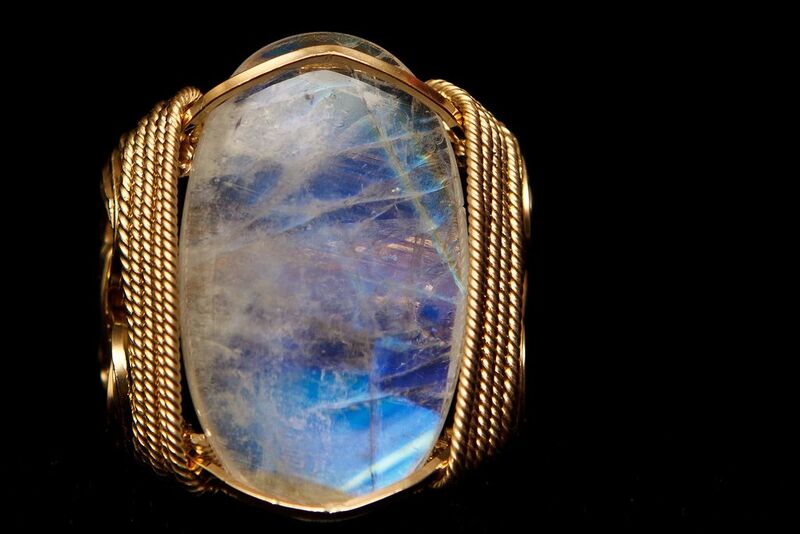 It wasn't until the 1960s that moonstone came back into fashion. Opalite is a man-made glass that is made to look like opal and moonstone. This is a simulated stone that is not a natural gemstone. Some sellers will try to deceive with fancy names like Opalite Moonstone, Sea Quartz, or Opalite Quartz. The stone is even referred to as Opalite Crystal and it's not even a crystal. What's even more confusing is that opalite is cut in a very similar way as moonstone. You will find it in cabochon shapes as well as carved into figures like moons. Most moonstone is cut into cabochon shapes. Domed cabochons highlight the stone's adularescence and opaqueness. In recent years, more designers are experimenting with faceted shapes, yielding good results from more transparent varieties of the stone. Since moonstone is a softer opaque stone, it can be carved into unique shapes. One of the most common shapes is the man in the moon face. This face has been incorporated into jewelry since ancient times. Carving a moonstone takes skill and expertise as to not chip the stone along one of the planes. Since moonstone is prone to chipping, gem cutters need to be careful with how intricate and fragile their designs become. The girdle of moonstone is never thinned out into a diamond shape. Even faceted moonstone gems are cut with thick girdles to help prevent chipping. Despite its close relation, rainbow moonstone is actually a transparent version of labradorite. Both moonstone and rainbow moonstone exhibit adularescence, though rainbow moonstone has blue or rainbow tones on a transparent stone. Regular moonstone has soft white or grey undertones on an opaque stone.